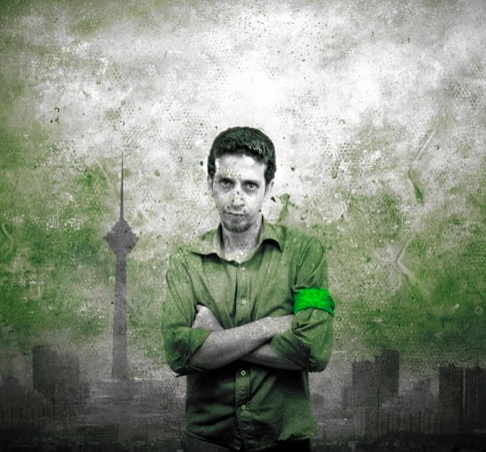 The youth of Iran have been absolutely pivotal in the success of the Green Movement. See below for their most recent impact on the newly opened university campuses all throughout Iran. I hope you are well. Some of you have forwarded Iran related information to me with a hint of “where is window 96?” And some have outright asked! It is so good to know that you are anticipating these windows. It has been a busy time in the semester. Let us open window 96 with a delightful music clip from the Jewish community in my own town, Shiraz. * Before we got pulled into the post election political whirlpool, I used these windows to give you a glimpse into the diversity of Iran. To be sure the political news is still interesting and very important. However, let us keep our cultural tradition going. * After this beautiful musical opening, let me move on to a piece of news about a great scientific breakthrough in Iran. Iranian Scientists in Ruyan Institute, using human embryonic stem cells, have treated serious spinal cord injury in mice. Watch the mouse regaining the power to walk after total leg paralysis: http://www.pbs.org/frontlineworld/watch/player.html?pkg=rc78iran&seg=1&mod=0. * Professor Lotfi A. Zadeh was awarded this prestigious award for his construction of the idea of “fuzzy logic” and fighting to get this seemingly “imprecise” approach to logic academic respect. 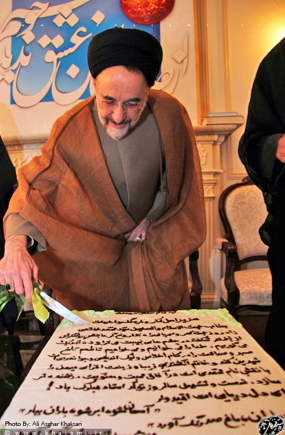 Khatami on his birthday with his giant birthday cake. 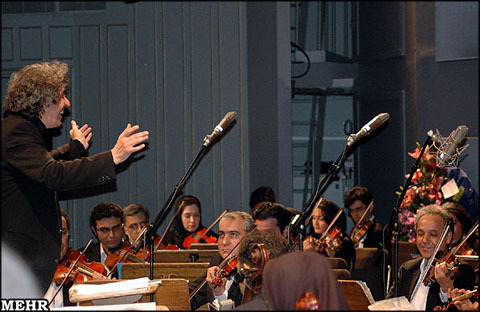 * On Oct. 12, 2009 Mr. Mohammad Khatami the reformist Iranian president (1997-2005) turned 66. He recieved a great birthday gift from his supporters who showed up in his office with an unusual cake. I made a very short slide show for you to see some happy scenes from present day Iran. Click here to see a slide show of pictures from his birthday party: Khatami Birthday Slideshow. * Someday a study should be done on the diverse and innovative tools that Iranian supporters of the Green Movement have used to communicate their deep conviction to improve the social conditions in Iran. I have included poetry and song clips in these windows. I have even shared images of banknotes with slogans on them. 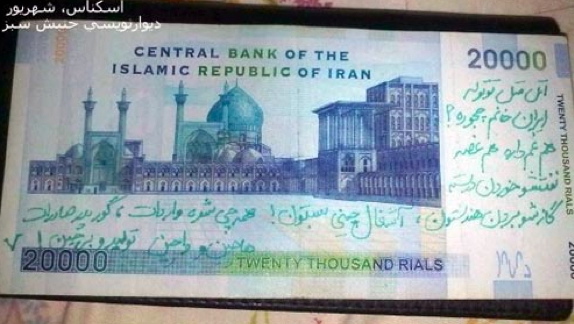 If you look below, you will see a banknote on which a well-known nursery rhyme has been re-written to tell the story of the Iranian economy: selling cheap oil to China, importing useless goods, and allowing domestic production to go down the drain. * The number of banknotes with green writings on them has reached a point that certain members of the parliament have suggested getting them out of circulation. Given the high percentage of such banknotes, however, the proposal does not seem practical. * You can read about these mothers who are becoming a global icon for justice: http://www.iranian.com/main/2009/oct/mourning-mothers. * As you will see in the item below, Iranian university students continue to demonstrate against the current government. The seriousness of these protests became apparent when Tehran Polytechnic conducted a Ph.D. defense in a building outside its main campus on Saturday, Oct. 10. 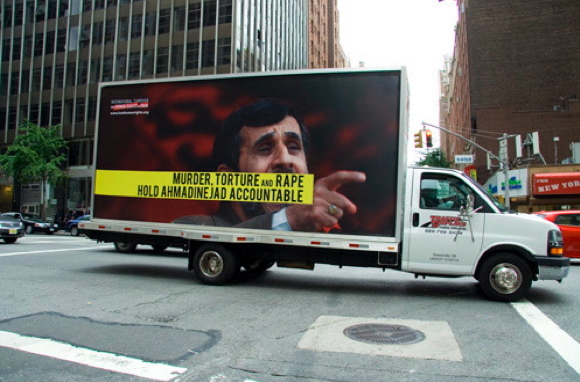 The reason why this defense could have led to protests is that the main advisor was Golam Ali Haddad Adel, a member of the Iranian Parliament who supports Ahmadinejad. According to the website of Tehran Polytechnic, even though the defense was moved out of the university, Haddad Adel’s name was still not mentioned in the announcement: http://www.autnews.me/node/3576. This is an article, not a clip describing the students protest: http://www.autnews.cc/node/3420. * Other major universities such as Isfahan and Tabriz University have reported similar incidents. * An interesting analysis of the recent events in Iran: http://www.iranian.com/main/2009/oct/whats-missing. * While from the outside, the Iranian political scene might look black and white (the hardliners verses the reformists), the reality on the ground is far more complicated. Days ago, Mr. Ali Larijani, a moderate conservative – and an opponent of Mr. Ahmadinejad – won the overwhelming support of his senior conservative colleagues in the parliament to stay in the leadership position. I would not present Mr. Larijani as a liberal by any means. However, in the recent events, he has criticized the conduct of the election, the state-run media, and Mr. Ahmadinejad himself. Here is some more detail of the vote in his favor: http://www.insideiran.org/media-analysis/parliamentary-speaker-larijani-prevails-over-pro-ahmadinejad-mps/. * Iranian bloggers are already busy posting images of wall writings and other announcements for the up-coming demonstrations: http://iranisabzpics.blogspot.com/2009/10/blog-post_9991.html. A beautiful painting by Ms. Shahverdi. Please click the link to your left for more of her incredible work. * Let’s close the window with a slide show of Ms. Shahverdi’s beautiful paintings. Unfortunately, her website does not provide much biographical information about her. Enjoy her paintings. 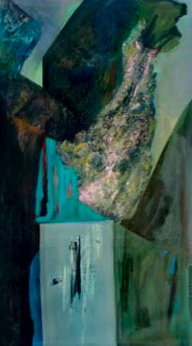 Click here for a slide show of her work: Ms. Shahverdi Slide Show. Don’t forget to share the blog with friends: https://windowsoniran.wordpress.com/. 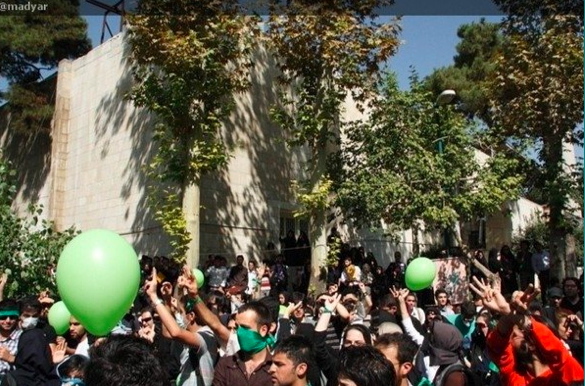 "Green" Protests continued as Tehran University opened for its first day of classes on September 29th. See the link to the left for more pictures from the Tehran University protests. Amidst rumors that Iranian universities may remain closed to prevent the students from contributing to further protests (the government suggested swine flue as the reason), they actually opened today. And so did the student protests. Click here to see a slide show of these lively demonstrations posted on the web a few hours ago: Protests on Tehran University’s First Day of Classes. * Unfortunately, the disclosure on Monday of a new nuclear facility in Iran is stealing headlines from very important political developments in the country. The truth is democratic developments in Iran could have more far reaching implications for the region than the building of a new enriching facility. Furthermore, according to people familiar with the Iranian nuclear industry (i.e. Scott Ritter) there was nothing secretive about this center and the U.S. knew about it for years: http://www.guardian.co.uk/commentisfree/cifamerica/2009/sep/25/iran-secret-nuclear-plant-inspections. * Busy with teaching duties and end of Ramadan ceremonies, I did not get to send out the information I collected on Qods day protests on Friday, September 18 in Iran. After months of forbidding Iranians from public protests, this was day they were allowed to protest freely. While the day was supposed to be dedicated to the Palestinian cause, they were converted to support for the Green Movement. While the Iranian government still lives in a state of denial pretending everything is normal in Iran, the intensity and the spread of these protests served to remind the people that the opposition is alive and well. And finally as Ahmadinejad speaks, thousands of people outside the building chant “dorugh gu! shasto do darsadet ku?” which translates to “Lier! where is your 62%?” referring to his claim that he won 62 percent of the vote in the election. To see all of the clips, click here: http://www.youtube.com/view_play_list?p=8B795CE302E95F0C&page=1\. Please remember to share https://windowsoniran.wordpress.com/ with friends. This is only one of the many very interesting photos from Hoda Alavi's new photography exhibit, entitled "Painting with Light." Please click on the link to the left for many more photos from her recent exhibit. Greetings! I am back to wish you all a wonderful 2008 — and to open another window on Iran. I hope you have had a peaceful holiday. In the spirit of celebration, let’s open this window with festive images of light and color. 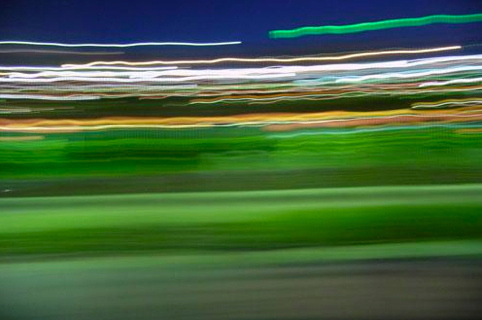 The young Iranian photographer Hoda Alavi uses urban landscape as her canvas and paints with light. Let’s visit her latest photo exhibit. Click on here to view it: Hoda Alavi Photography Exhibit. * While on the subject of women, I have a very interesting article for you from the Guardian (Jan. 9) courtesy of Amir Companieh. The essay encourages readers to forget about stereotypes and look instead at the reality of women’s vibrant and organized activism in Iran: http://www.guardian.co.uk/iran/story/0,,2237579,00.html. Noushin Ahmadi Khorasani (with the bullhorn) leads thousands of women and men gathered at Tehran University to demand equality in the Justice system. Despite what the mainstream media in the U.S. and Europe will often tell you, there is currently a strong (and growing!) women's movement in Iran. To see more photos from this protest and others please click on the picture above (image courtesy of http://www.kosof.com). * Still on the subject of women, take a look at images of Iranian women chess players competing for the national championship. Chess is an extremely popular hobby in Iran: http://www.shirzanan.com/spip.php?article1036. * Over the holidays, I read an excellent book which I recommend to anyone interested in better understanding the complexities of the strategic games played by various regional and outside forces in relation to Iran and its neighboring countries. Authored by Trita Parsi and published by Yale University Press, the book is called Treacherous Alliance: the Secret Dealings of Israel, Iran, and the United States. * Daniel also distributed a video supplied by the Iranian Navy which suggests that the incident was a simple and routine exchange in the Gulf: http://www.politube.org/show/341 [or click on the video below to view it]. * Today’s Washington Post, contains an article that supports Dr. Pourkesali’s view suggesting “Iranian Boats May Not Have Made Radio Threat, Pentagon Says,” *check it out: http://www.washingtonpost.com/wp-dyn/content/article/2008/01/10/AR2008011000692.html?sub=AR&sid=ST2008011001831. There we are! More misinformation about Iran…and really scary misinformation at that! 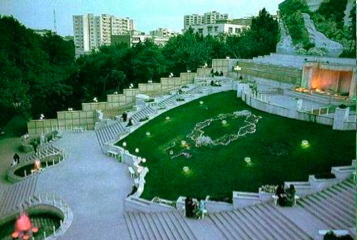 The new Tehran Peace Museum in Tehran City Park. * Iran will open a peace museum to promote sentiments for peace in a culture that still remembers the pain of an 8-year war that started with Saddam’s aggression and led to his use of chemical weapons on Iraqi Kurds and Iranians. The museum which will soon open in Tehran City Park has the sculpture of a white dove at its entrance. While attributing imaginary violence to the culture is common, Christian Science Monitor’s exceptional attention to this museum is commendable. Not surprisingly, the tone of the article suggests that the museum is something of an aberration in a culture that “glorifies martyrdom.” It would be fantastic if the author of the article Scott Peterson would have the opportunity to take a trip to Iran. 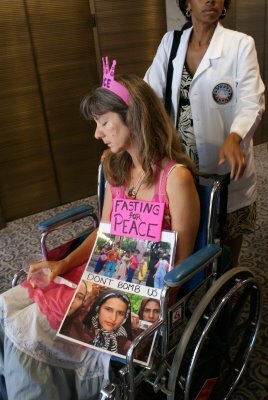 You can read the article on the Peace Museum in Iran at: http://www.csmonitor.com/2007/1224/p01s03-wome.html?page=1. * Iranians love live music. When master musicians perform, it is common to line up outside the concert hall from the night before the box office opens to make sure you can obtain tickets. I would like to close this window with a ten minute clip from a Sufi music performance at Vahdat Hall, a major concert hall in Tehran. The concert was sent to me by a dear friend, Nakhostin Javidani: http://www.youtube.com/watch?v=17wue10S0l0&feature=related [or click the video below to view it]. Until our next window, have a great week! fun talks about Rumi’s work, I read poetry to music, and listened to Robert Bly reading some fantastic poetry. I had prepared this window to send out before traveling to Stanford but I forgot to send it as I got busy preparing for the trip. outfit. 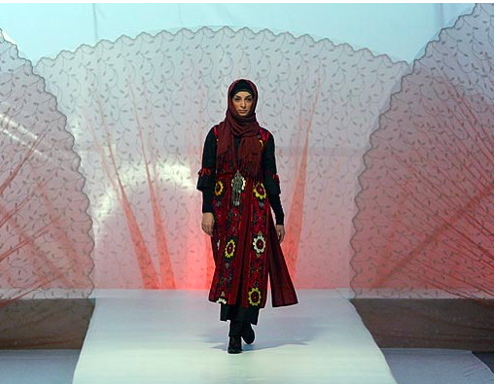 Click here: Women’s Fashion Show in Tehran. I am often asked if visual arts are forbidden in Muslim countries. publication from their emergence in Iran (Persia) to 1997.
nicely, and I turned them into a slide show for you. Please click here: Sa’dabad Palace. Enjoy! let me know if you are missing any of the windows. Without further ado, here comes window number 9 on Iran. 11, President of the National Iranian American Council (NIAC) Dr.
large number of Iranian Americans attended. * I promised to keep you updated on the Iranian American community. read the most recent study done at MIT, click here: MIT Study on Iranians in the U.S.
present the Iranian reformists as a threat in time of crisis. * Let me introduce you another great Iranian writer from Shiraz. Iranian women to receive a Ph.D. from Tehran University in 1949.